Hi friends, this is Candice with a recap of today’s edition of WildWorks. This week was an important one for Lenny – the 10th anniversary of the death of Hong Kong Cantopop legend Leslie Cheung. Cheung was one of HK’s biggest stars, releasing more than 30 albums and acting in over 60 movies. Known affectionately as “Goh Goh,” translated as ‘older brother,’ he was also one of the first pop singers in Hong Kong to publicly acknowledge his bisexuality. However, on April 1, 2003, Cheung committed suicide by jumping from a hotel room balcony. He was 46. To mark the occasion, Lenny put together a few medleys of classic Cheung standbys. It featured songs like “Silence is Golden,” “Black Midnight,” and “A Man of Intention.” We also played a live version of Sandy Lam’s song, “At Least I Still Have You,” taken from the Passion Tour in 2000, which was the last tour before his death. Being the tenth anniversary, there are several events happening in Hong Kong to mark the occasion. The image chosen for this year’s tribute is the cover to his 1987 album, Summer Romance. It’s an iconic image as the album became critically acclaim and put Cheung into major stardom. If you’re reading this entry after April 1st, 2013, some links to check out. A story over at AsiaOne/The Straits Times about the last phone call that Leslie Cheung made on the fateful day ten years ago. Elsewhere on the show, we played some good ol’ CanCon, with folky tracks from artists like Octoberman and the Abramson Singers, both of whom are playing at Raw Sugar Café tonight. We also referenced a bit about the two pandas arriving to Toronto and decided to play a song called Slippery When Wet by The Acorn as it mentioned about the cuddly animal. Scary Bear Soundtrack released a new track called Victoria Island, as it got revealed on Tuesday night. OK, I couldn’t think of a good title. On this week’s edition of the show, I had the opportunity to have Gloria from Scary Bear Soundtrack join me on the show because she has been promoting a live show at Babylon Nightclub for Wednesday night (today). It’s also her final live show as she will be moving to Nunavut at the end of January. Even though, it’s her swan song, the band is doing a music video party release before leaving to the Northern confines of the Arctic. On the radio show, Gloria picked some of her music picks from the likes of Melissa Laveaux and gatesgatesgates while there were brand new music on my end from You Say Party, Leif Vollebekk and The Matinee. January is a bit slow in terms of new music being released. It was another blessing in disguise to have a guest on the show. It was an unexpected surprise to play You Say Party’s new song right away as it was announced on social media and music sites. It’s great to hear about the band reuniting after their tough time back in 2010. Also mentioned during the live show was talking PSY’s Gangnam Style. Overall, a good mix of new wave, rock and folk music all in one for this week’s show. The first half of the show for this blog is the Wild 10 Countdown. For the second week on the top spot, Pick Me Up by Hollerado is still number one. The top 10 countdown for January 16th is over at this link. After the countdown, I discussed about Arts & Crafts celebrating their 10th anniversary and Broken Social Scene reuniting for one night only. What I forgot to do was mention Broken Social Scene in the playlist set. It’s after Caught a Long Wind by Feist. I blame my co-host for no-showing. The playlist for the radio show is over at this link. Finally got New Myspace and my profile is over at this link. Hopefully the new version has a good following and not fizzle out. All I can say to Gloria, enjoy your time in Nunavut, your presence in Ottawa will be missed but two years can go by quickly. After some personal convincing and a schedule change to an event in Ottawa this year, I decided that it’s finally time to go to the big smoke, Toronto and attend NXNE. Although, I didn’t get a lot of time to spend in Toronto and the live music around various venues, I’ll admit to opening up positively to Canada’s biggest city (thanks to two people). Aside from that, I arrived on Friday and walked from the train station to NXNE headquarters to pick up the media pass, then checked in the hotel and then leave to go to CBC Toronto Broadcast Centre for a tour around CBC Radio. It was great to meet up with CBC Radio 3 fans. After the tour, the rest of the R3 gang went to a pub and Grant Lawrence showed up later. I had the opportunity to interview him for his thoughts on the music festival. Afterwards, I had to take a long walk to Bathurst Street to interview Papermaps and Wendy Versus (a bonus interview). This week’s radio show had interviews from Grant Lawrence and Papermaps. On Saturday night, I had some time before going to the legendary Horseshoe Tavern, I stopped by the Cameron House because a singer I watched from an Internet show was performing there. The singer was Robyn Dell’Unto. From the one song I caught, all I can say that she has a lovely voice. I was like wow in my head. Afterwards, I rushed over to the Horseshoe Tavern for the CBC Radio 3 Showcase. It consisted of Poor Young Things, Yukon Blonde, Lumineers, Young Empires, and CATL. Some of the R3 fans were in attendance and it was great to see Craig Norris as well. I finally got a chance to see Yukon Blonde live because whenever they’re in Ottawa, I tend to miss out but it’s in Toronto that I got to see them. They totally rocked the Horseshoe Tavern and great singing along to their songs. Overall, I definitely had a great time at NXNE in Toronto. You can listen to the radio show and interviews below. 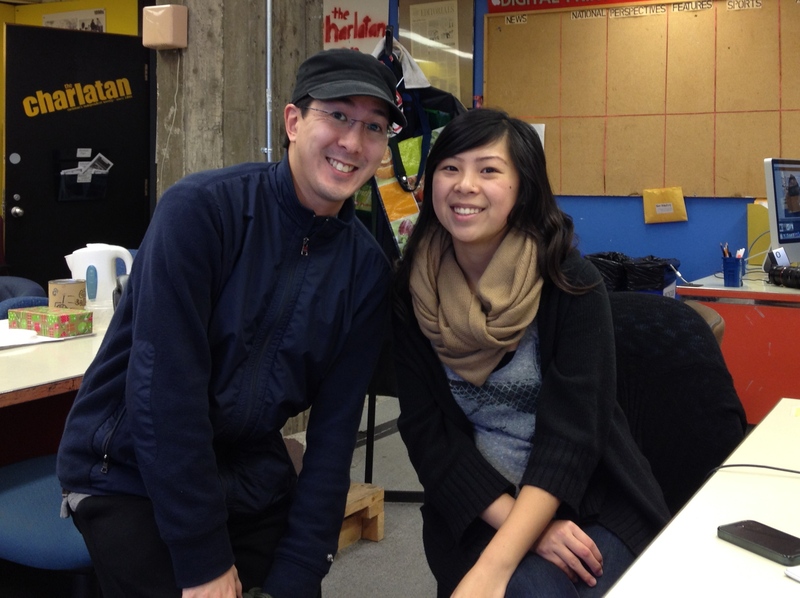 Lastly, another priority to going to Toronto was to meet with the lovely hosts of Nat & Marie. Let’s say they’ve been pretty influential in my approach in using social media for my radio show and other activities. After the CBC tour and music interviews, I got to meet up with Marie of Nat & Marie. Originally, her partner in crime (Nat) was supposed to join us for sushi but had family obligations. The next day, they were kind enough to meet up again and finally do an interview. The funny story was Nat tweeting me that’s she’s at Starbucks and I left the NXNE headquarters to Queen St. West. I was rushing frantically back to the site to Starbucks to meet them. The rest is history as we got to chat and interview. Unfortunately, I missed out on the unofficial CBC Radio 3 picnic at Trinity Bellwoods Park. Still, I wanted to meet my new idols or social media darlings as I’ve been tuning to their Internet show. Expect the interview to be aired in July. I didn’t realize I was mentioned in their Tumblr post from June 15, 2012 at this link. I’m on the final line of their entry. The playlist for the June 20th show is over at this link. Radio show for June 20th – Press play to listen. It was a great privilege to chat with Will Currie from Will Currie and the Country French on the weekend. The band has been around for a couple of years and I did not get a chance to do an interview them when they stopped by in Ottawa. The interview was aired on Wednesday’s show at CKCU-FM. It’s been awhile that I have done a music interview because it was a slow time during the holidays and up until January of 2012. The interview with Currie was light-hearted at best and really wished that my co-host was there to help out as well. Overall, it was nicely done. Oh yes! Even though I rarely mention it on my show, I had cupcakes to bring along for Will Currie and The Country French and almost forgot that it was the lead member’s birthday at the time of the recording. 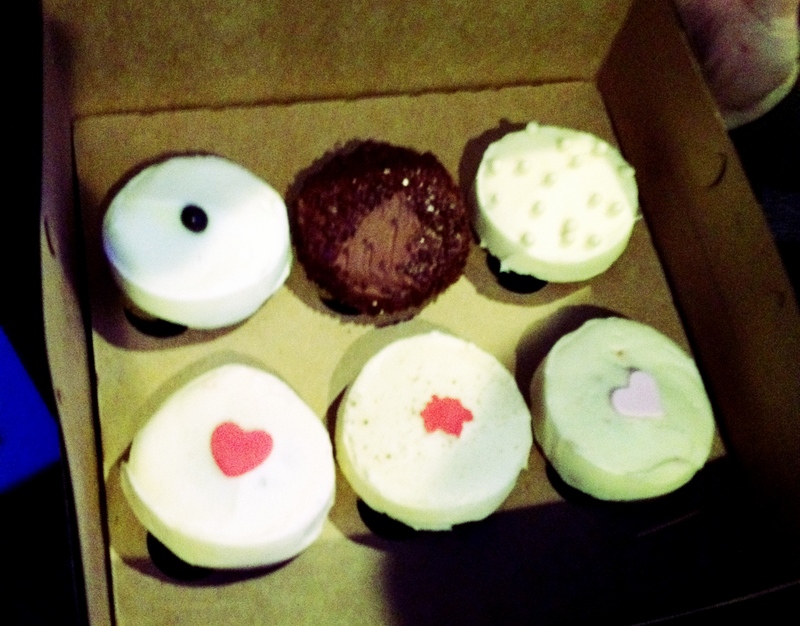 The photo of the cupcakes is posted below. Don’t forget to listen to the radio show and the interview at your own time. The playlist for Wednesday’s show is over at this link. The Wild 10 Countdown summary will be posted later. The full February 15th show – Press play to listen. The live part of the show – Press play to listen. The second radio show of January 2012 were interesting and fun as I had some new tracks to play and the return of Lauren as she returned from her holiday. To start off, there’s a going to be a bunch of new albums coming out for January and February. On the live part of the show, there were new tracks by Sleigh Bells, The Wooden Sky, The Darcys (again), and Joel Plaskett Emergency. Halfway through the show, Lauren and myself talked about the Coachella lineup and then ending off with the 2nd anniversary of Haiti earthquake. With the Haiti earthquake, I had the opportunity to give my support to the wonderful organization, Kanpe Foundation through DAVIDsTEA. Kanpe is really dedicated to help rebuild Haiti and they’re still continuing with the achievements to keep Haiti strong. Back to the Coachella lineup, one song I played was pretty nostalgic as it was Fade Into You by Mazzy Star. It’s quite a surprise that the band is still around after all these years. It was fitting to play it even though it’s a bit sombre to listen to the song. In other CKCU related stuff, my entry for the favourite artist of 2011 is posted at this link. It’s about Emmy The Great. The playlist for January 11th’s show is posted at this link. The Wild 10 Countdown summary is at this link. The full January 11, 2012 show – Press play to listen. The live part of WildWorks for January 11, 2012 – Press play to listen. I can’t believe that November has gone by quickly and the odd thing has been the early Christmas specials being aired so early on the television. It’s a couple of weeks away until Christmas. My own festive mood will certainly kick. Today’s radio show was 2 hours live on the airwaves in Ottawa. I was supposed to have guest co-host, Candice So, join me but there was a complication as she couldn’t help me on the show. At least she was able to drop by for a bit and gave her a lovely holiday tea as an early Christmas gift. No one is to be blamed with the miscommunication. Saving the show was the return of Lauren as we counted down the top 10 Canadian indie songs. The second hour of the show had the interview with The Darcys. They were in Ottawa recently and I had the chance to chat and talk about their new album. Without further ado, the playlist is at this link. The Wild 10 Countdown summary is over at this link. Lastly, it was a privilege to have Candice So on the show for the previous two weeks. All I can say that you’re wonderful and awesome to be around. Wished you were there for the November 30th radio show. The photo of us is posted below as well as the interview and the radio show. Enjoy! The November 30th radio show – Press play to listen. Update on Sunday, November 27, 2011 – Added Friday’s radio show. Today’s entry is brought to you by the object, snow. That’s right! Snow walloped Ottawa causing slowdown on traffic for Wednesday morning. The radio show and podcast was almost fallen into place because of the weather. Candice So made a return to the show and we had an enjoyable and funny time on the show, despite the gloomy weather. For this edition, So was the host and I was the co-host/sidekick. The recording for the top 10 songs got reversed because of the snowy weather. Also on the show was the interview with Neil Haverty of Bruce Peninsula. The band was in Ottawa last week for a show. It was a nice opportunity to conduct an interview with the band and to my own amazement, I did a good job on the interview itself. The audio is posted below. Have a good week! The playlist of the radio show is at this link. The November 23rd radio show – Press play to listen. The November 25th Radio Show – Filling in for Friday Night Derailment. The playlist is at this link.